The Relief Max Adjustable Air Mattress provides all the benefits of powered and non-powered systems in one unit. It provides pressure relief and redistribution comparable to powered systems without the noise, heat, power consumption and breakdowns. It offers the advantages of non-powered systems while still providing a dynamic surface which custom adjusts to each individual patient automatically. 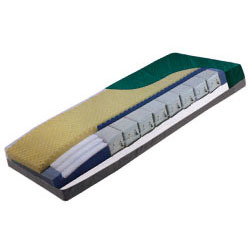 The Relief Max is designed with eight air sectors placed horizontally throughout the mattress. The Dynamic Pressure Delivery System utilizes a proprietary vent and check valve system which automatically adjusts according to patient’s pressure profile. The result is a support surface that achieves incredibly low interface pressures without the need for pumps, blowers or a series of microprocessors. The cover is fabricated with quality materials treated with anti-bacterial/anti-microbial agents to help prevent MRSA, infections and odors from forming. The Relief Max is incredibly comfortable, and can be used with standard hospital bed frames. There is no worry of system malfunction due to power loss or pump breakdown. The Relief Max offers the most powerful combination of clinical and cost effectiveness on the market today.